What is NFL? It is America's National Football League, the biggest sports franchise business in the world. It's much bigger the Indian Premier League (IPL) cricket franchise which is much better known to South Asians. The IPL has particularly been in the news lately for its controversial exclusion of Pakistani cricket players. Bollywood star Shahrukh Khan, who criticized Pakistanis' exclusion from IPL, has come under attack by right-wing Hindu extremists who are rampaging through the streets in India, burning theaters screening Khan's latest movie. 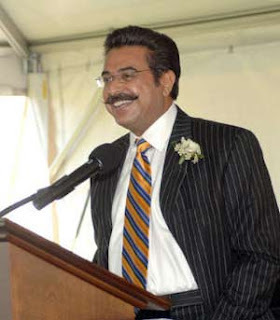 Today's media reports indicate that a Pakistani-American Shahid Khan of Illinois is in $450-$750 million deal to buy the NFL team St. Louis Rams. The final price will depend on whether Khan gets 60% or 100% of the stake in the NFL franchise. Khan, 55, is the president of Flex-N-Gate Corp., an auto-parts manufacturer in Urbana, Illinois with $2 billion in annual revenue. He has lived in the Champaign-Urbana area for more than 40 years and is married with two adult children. Khan is a graduate of the School of Mechanical and Industrial Engineering at the University of Illinois. Flex-N-Gate employs over 9,500 people at 48 manufacturing and 9 product development and engineering facilities throughout Canada, the United States, Mexico, Argentina, and Spain. Khan, 55, and his wife, Ann Khan, live in Champaign. He has given millions of dollars to his alma mater, including funding a 2007 major expansion of the university’s tennis facilities — now called the Shahid and Ann Khan Outdoor Tennis Complex. To put this deal in perspective for South Asian readers, "Mumbai Indians", the most expensive of the eight IPL franchises, was bought by Indian billionaire Mukesh Ambani for $112 million. This season, each of the 32 NFL team owners were limited to $127m in salaries for their entire squad of players. That means some footballers are handsomely paid - Drew Brees, the star quarterback of the recent Superbowl winner the New Orleans Saints, has a six years $60m contract. By contrast, the most expensive IPL players fetch less than a million dollar bids, which are still the highest in the world for cricket players. Indian cricket has taken a page from the big sports franchises in the West. Forbes magazine reports that the Board of Control for Cricket in India (BCCI), a nonprofit body controlling the game in the country, has racked up $1 billion to date from selling commercial rights to Indian cricket for the next five years. (One source: Nike paid $45 million to flash its logo on players' apparel and to sell garments to cricket fans.) "It's all about extracting the most value," said Lalit Modi, BCCI's new marketing chief, who hopes to eventually make $1.5 billion from Indian cricket, ten times what BCCI made in the last go-around. In both IPL and NFL, the biggest source of revenue is the sale of television rights, followed by brand name merchandise sales, ticket sales and endorsement deals. Shahid Khan is obviously an outstanding success story for Pakistani-Americans. Nationwide, Pakistani-Americans appear to be prospering. The US census calculated that mean household income in the United States in 2002 was $57,852 annually, while that for Asian households, which includes Pakistanis, was $70,047. Hard numbers on how many people of Pakistani descent live in the United States do not exist, but a book published by Harvard University Press on charitable donations among Pakistani-Americans, “Portrait of a Giving Community by Professor Adil Najam,” puts the number around 500,000, with some 35 percent or more of them in the New York metropolitan area. Chicago has fewer than 100,000, while other significant clusters exist in California, Texas and Washington, D.C.
New York Times estimate of 109,000 Pakistani-born American workers' occupations include salesmen, managers or administrators, drivers, doctors and accountants as the top five categories. Pakistani-Americans political participation remains woefully inadequate. But there are some signs that it is beginning to happen at various levels starting from from local communities to state legislatures. "Shahrukh Khan, who criticized Pakistanis' exclusion from IPL, has come under attack by right-wing Hindu extremists who are rampaging through the streets in India, burning theaters screening Khan's latest movie. " Am I missing something? SRK said that pakistanis are great neighbors, which irked Indians. I guess he compares India and Pak relationship to USA and Canada. Salman Khan, another Bollywood star rightfully said that if SRK loves Pak players so much, what stopped him from bidding for his team KKR. Anonymous has got it right. There are diffrent factors to be considered here. US economy is like 10 times bigger than Indias. Correspondingly the purchasing power is also limited. But, India's population is 4 times that of the US. Not surprisingly IPL is on its way to become the biggest sporting event in terms of viewership and money in the next 5 years beating the NFL on its way. If you want to assess how much IPL has grown just wait for the auctions of 2 new teams one of which is to be bid my another Indian Muslim, another success story of a member of the minority community, Salman Khan. So, the initial teams which were auctioned off were just testing the waters. The present worth will be proven by the auctioning off of 2 new teams slated to be held in July(I think). In spite of many advantages NFL will lose the crown to IPL. anoop: "In spite of many advantages NFL will lose the crown to IPL." IPL will definitely grow, especially if it's kept as open as the NFL and other sports like MLB, and Ice Hockey in the US where the best athletes from around the world compete. "NFL will loose crown to IPL"
Really? I very much doubt it. Last week's superbowl was watched by 106Million. Besides, cricket, as a game, is loosing it's shine. On a lighter note, the way Rams have been playing for a decade now, I can just wish Mr Khan a good luck. India has ordered an investigation into the financing of the Indian Premier League (IPL) following allegations of corruption in the cricket tournament. The move follows the resignation of junior foreign minister Shashi Tharoor amid controversy over his role in bidding for one of the IPL's new teams. India's finance minister said "no wrong-doer would be spared" in the probe into the league's funding. But IPL chief Lalit Modi denies any allegations of funding irregularities. Mr Modi has described the claims as "absolutely baseless". Opposition lawmakers in parliament have alleged that the league has been used for money laundering and illegal betting. Finance Minister Pranab Mukherjee told parliament that tax authorities had already begun an investigation. "All aspects including sources of funding and routes through which the funds arrived would be looked into," he said. Indian cricket's governing body also said it would meet to discuss the allegations against the tournament. Media reports suggest there are plans to force Lalit Modi from his office. The IPL has become a multi-billion dollar industry, which attracts some of India's wealthiest businessmen and women. Cricket's popularity with the Indian masses means that politicians are also keen to get involved with the sport, BBC correspondents say. Mr Tharoor resigned on Sunday after a row over allegations that a female friend, Dubai-based businesswoman Sunanda Pushkar, received a free stake in a new IPL franchise. He denies any wrongdoing in the bid for the new Kochi cricket team, to be based in his home state of Kerala. Mr Tharoor claimed he was just a mentor for the team and denied allegations that he was set to benefit financially. He and Ms Pushkar say the stake was awarded as "sweat equity" in return for marketing and professional services to the new franchise - but Ms Pushkar has now offered to surrender the stake. His resignation followed a public spat between Lalit Modi, the head of the IPL, and Mr Tharoor over ownership of the new cricket team for Kochi. Kochi was sold to Rendezvous Sports World Limited for $333m at auction. It and Pune are to join the IPL from 2011, taking the total number of teams to 10. Meanwhile in Bangalore, officials are angry that this week's semi-finals have been moved to Mumbai for security reasons. Politicians and police in the city say they were not consulted about the move, which followed two small bombs before a game on Saturday. Lalit Modi is the biggest sporting impresario India has ever produced - cricket's answer to Don King of boxing or Bernie Ecclestone of Formula One. More than a decade ago, Modi helped international sports channel ESPN win the rights to broadcast cricket matches in India, where state TV had until then had a monopoly. Years later, he shaped the hugely successful and lucrative Indian Premier League (IPL) with all its colour and razzmatazz. But today, the IPL guru is mired in allegations of money laundering, improperly awarding franchises for new teams and, worse, possible match-fixing. Modi, 46, maintains he has done nothing wrong. "It is a trial by the media, nothing has been proved," he told a jam-packed DY Patil stadium in Mumbai (Bombay) on Sunday night, seconds after Chennai Super Kings had won the third edition of the IPL. The Indian government inquiry will take months, probably years - but that Modi is down and out from the Board for Control of Cricket in India (BCCI), the world's richest cricket board, is amply clear. In just a few years Lalit Modi turned the IPL into a $4.13bn commercial phenomenon that Forbes called the world's fastest growing sporting event. It attracted business tycoons and Bollywood stars, but cricket watchers say he rarely followed the rules. He decided almost anything and everything that happened within the IPL. Lalit Modi studied for a sports management degree at North Carolina's Duke University Business School in the United States. While a student there he was convicted of kidnapping and assault. A spokeswoman for the North Carolina courts told the BBC that Modi received a two-year suspended jail sentence and a $10,000 fine in June 1985 after entering a plea bargain. Armed with his degree, Modi later returned to India to introduce the magic of ESPN's high-voltage cricket coverage. He also handled global brands like Estee Lauder and Phillip Morris, and was instrumental in bringing Fashion TV to India. A scion of the multi-millionaire family which owns Modi Enterprises, he is also a member of the board of Godfrey Philips, a top Indian tobacco company. Modi - who owns a private jet and a yacht - always wanted to live life king size, a popular marketing tag for one of his cigarette brands. Ever the showman, he arrived at the ground in Mumbai for the IPL final in a helicopter. Some have called him the man with the Midas touch. He flaunts his power by moving around with a phalanx of private bodyguards, the first sports official in India to do so. His aides say there are threats to his life because of his high profile. Lalit Modi likes the high life, combining cricket with entertainment. Guests paid up to $1,000 to attend his after-match parties where they could mingle with cricketers, starlets and models. Cricket apart, India is one of the great underachievers of modern sport. Until 2008, India's Olympic golds had all come in hockey. In Beijing, the country did win its first individual gold in shooting, but it has never done anything of note in the high-profile events of swimming, track and field. Its contingent for the Winter Olympics in Vancouver was so shambolic that the city's large Indian origin population started organising donations for the team. The odd individual Indian has sometimes made sporting headlines but, given the country's immense size and its long exposure to western sports, its failure to make a mark on the world sporting stage is astonishing. One explanation has been provided by Ashwini Kumar, a former vice president of the International Olympic Committee. "India has no base for sports despite its enormous population. Sport in our country is khel-khood (just a bit of fun)," he said. "It goes against the grain of our country, against our tradition to play sports the way they do in the West. If a child in our country returns from the playground, he is not asked by his parents how he fared, but slapped for missing his studies and wasting his time. Sport is against our Indian ethos, our cultural tradition." It has been estimated that less than 2 per cent of schools have playgrounds and even these are not the sort of playing fields common in the West, but just a little piece of open land where the children can run about. Matters are not helped by the fact that education is not controlled centrally but by the various state governments. This leads to a profusion of policies, with sport often falling between the two stools of the centre and the state. Unlike other countries, Indian politicians have historically shown little interest in sport. The Commonwealth Games are due to start in Delhi the day after India celebrates the birth of Mahatma Gandhi. Yet the man venerated as the father of the Indian nation never concealed his aversion to sport – a fact that he frankly confessed in his autobiography. Indeed, in 1932, when Indian hockey ruled the world and Gandhi was asked for help in funding the team's participation in the Los Angeles Games, the "great-souled one" famously enquired: "What is hockey?" The contrast with China and Mao could not be starker. The first paper Mao wrote back in 1917 was about the importance of sport. In language that the Victorians, who popularised sport in this country, would have understood well, he said: "It is absolutely right to say that one must build a strong body if he or she wants to cultivate inner strength." For Mao, sport was also part of state policy, as he demonstrated in the 1970s by using "ping pong" diplomacy to seek a rapprochement with Richard Nixon and the United States. The great Indian savant Swami Vivekananda did once advise his countrymen that they would find God more easily if they played football rather than spent hours studying the Gita – the Hindu bible – but his was a voice in the wilderness. Jawaharlal Nehru did his bit for sport and cricket in particular, not least by keeping India in the Commonwealth – a decision which went against the policy of the ruling Congress Party. But, unlike China, sport in India was never part of any centrally-driven policy. This sports vacuum has been ideal for bureaucrats and low-level politicians, who have found sport a useful base upon which to build public support. Their path has been helped by the fact that, cricket apart, former Indian sportsmen and women have little or no involvement in running sports organisations, and most sports, particularly those contested at the Olympics, do not attract much commercial support. Shahid Khan's bid to acquire SL Rams was unsuccessful. The sale seemed almost complete just a few days after the Super Bowl in February when Shahid Khan of Urbana, Ill., an auto parts manufacturer, entered into a sales agreement with the Rams. Two months later, Kroenke surprised just about everyone, Rosenbloom and Rodriguez included, when he exercised a right of first refusal matching the Khan sales agreement. And now, four months after exercising that right, Stan is the man running the Rams. "I have nothing but best wishes for Stan Kroenke as the new controlling owner of the St. Louis Rams," Khan said in a statement. "I have gotten to know Stan very well this year, I admire his success and I am certain he will be an excellent owner for the Rams, the National Football League and the St. Louis community. "I'll always appreciate the trust Chip Rosenbloom and Lucia Rodriguez put in me, and I thank Commissioner Roger Goodell and team owners for their professional approach in everything related to the sale process. This adventure didn't turn out the way I had hoped, but it was otherwise a worthwhile experience in every respect and I'll always be a fan of the St. Louis Rams." Moeen Qureshi in 1995. (Tyler Mallory/The Washington Post) Details: This 11-bedroom home (yes, 11) has a lot of character. It sits on half an acre nestled between the vice president’s house and Rock Creek Park; it’s owned by a former prime minister of Pakistan; and it’s currently the second highest-priced home for sale in D.C. (Georgetown’s Halcyon House still seeks a buyer, for $15 million.) The 22,000-sq.ft Mediterranean-style mega-villa actually started life as two neighboring houses that Qureshi bought in 2000 and rebuilt with a connector bridging them. (The former World Bank exec, 81, oversaw his home country for three months during a 1993 government crisis before moving into private equity.) Qureshi briefly had the mansion on the market in 2006 for $21 million, so we’re talking about a serious bargain now. There’s a pool of course. Three of those 11 bedrooms are designed for your household staff. Nov. 29 (Bloomberg) -- The Jacksonville Jaguars will be sold to Shahid Khan, the owner of auto-parts maker Flex-N-Gate Corp. who failed in a bid last year to buy the National Football League’s St. Louis Rams. The Jaguars, who have a 3-8 record this season and fired coach Jack Del Rio today, are the only team in the four major U.S. professional sports to play in Jacksonville. Khan plans to keep the franchise in the northeast Florida city rather than relocate, owner Wayne Weaver said at a news conference. The Jaguars have an estimated value of $725 million, the lowest in the NFL, according to Forbes. They rank 26th among the NFL’s 32 teams in attendance this season. Khan, a native of Pakistan whose company is based in Urbana, Illinois, agreed in February 2010 to buy a controlling interest in the Rams before billionaire Stan Kroenke exercised an option to purchase the 60 percent of the club he didn’t own. Weaver, the owner of shoe retailer Shoe Carnival Inc. and chairman of wholesale distributor Liz Claiborne Shoes, bought the Jaguars for $208 million in 1993, two years before they started play as an expansion team. Weaver said he refused to take several calls from interested buyers in California, where the city of Los Angeles remains without an NFL franchise. Khan left Pakistan in 1967 at the age of 16 to attend the University of Illinois at Urbana-Champaign and began working for Flex-N-Gate three years later while still an engineering student. Khan left the company in 1978 to begin a business that designed and manufactured lightweight metal bumper systems, with no seams to corrode or rust. Today, almost two-thirds of all North American-built pick- up trucks and sports utility vehicles have bumper systems based on Khan’s designs, according to figures released by the Jaguars today. Khan bought Flex-N-Gate in 1980 and the company now has more than 10,000 employees at 48 manufacturing plants with annual sales exceeding $3 billion. The team made the playoffs in four of its first five seasons and has been to the postseason twice since. Jacksonville last finished with a winning record in 2007 and has had a series of home games “blacked out,” which means they can’t be televised locally if tickets aren’t sold out 72 hours before kickoff at EverBank Field. The Jaguars cut starting quarterback David Garrard in September five days before their first regular-season game, a move that saved the team $9 million..
Shahid Khan was 16 when he moved from Pakistan to the United States to attend the University of Illinois. While hanging out in the basement of his fraternity house, he began his American dream of owning an NFL team. After building a multibillion-dollar company, Khan started working toward spending some of his fortune on fulfilling that college fantasy. He reached out to owners such as Wayne Weaver of the Jacksonville Jaguars to learn the business from the inside, and for them to get to know him. Khan's dream-turned-plan crossed the goal line Wednesday. He joined the fraternity of NFL owners as his purchase of the Jaguars from Weaver was unanimously approved by the other owners. The deal is for an estimated $760 million. The ownership transfer will be complete Jan. 4. "What I want to share with the Jacksonville fans is: Here I am, reporting for duty and ready to serve the fans. Let the fun begin,'' Khan said with a smile that never left his face during a 20-minute news conference. Then again, what he's done to get to this point is pretty remarkable. Upon graduating from college in 1971, Khan went to work at Flex-N-Gate as an engineering manager. He left in 1978 to start his own company, Bumper Works, and two years later bought his former employer. Now his privately held company is a major manufacturer of bumper systems for pickup trucks and sport utility vehicles built in North America. Revenue last year topped $3 billion, and Khan is believed to be a billionaire himself. He tried buying the St. Louis Rams last year, coming close enough that the league had done its homework on him. That helped speed along this sale. The deal was announced in late November and the league's finance committee formally approved his bid last week. When the agenda item came up Wednesday, there wasn't a single question or dissenting vote. Thank goodness pro football doesn't have a salary cap on boats. The NFL's newest owner, Shahid Khan, is looking to unload his majestic 223-foot yacht for the cool price of $112 million. The Jacksonville Jaguars boss recently put the 2007 German-made vessel he calls the Kismet up for sale with Moran Yacht & Ship of Ft. Lauderdale, Fla.
What do you get for $112 million? A better question would be what don't you get? The ship comes loaded with a formal dining salon, disco, teak decks, jacuzzi, sauna and gym. High-end woodwork details everything from a beer keg to a motorcycle hatch with crane. There's also a 25-foot Chris Craft boat, Yamaha WaveRunners and other surpasses, the Florida Times-Union reports. The ship sleeps 12 guests in six impressive staterooms with crew of 17, including three stewardesses, a chef, a sous chef and the always important masseuse, beautician and therapist. If the asking price is too high for your modest budget, Khan is making his big boat available to rent as the much more affordable price of $600,000 per week -- plus expenses -- for Caribbean cruises over the winter and about $789,000 a week for summer trips to the Mediterranean, according to the Times-Union. By the way, the Kismet's asking price ($112 million) is 34 percent more than the entire Jaguars player payroll (around $73 million) last season. Last week’s sale of the Jacksonville Jaguars thrust soon-to-be new NFL owner Shahid Khan into the spotlight. A low profile private businessman for 30 years at Flex-N-Gate, an international auto supply company, he had rarely appeared in national press and never before was listed among the Forbes 400 Richest Americans or on our list of the world’s billionaires. Khan’s acquisition of the NFL team for $760 million and the strong performance of his company suggest that indeed he may be one of the richest people in America. A naturalized U.S. citizen, Khan immigrated from Pakistan in 1967 at age 16. He built his wealth, which is likely enough to earn him a spot among the world’s billionaires in our 2012 rankings, through Flex-N-Gate, which he originally joined while earning his engineering degree from the University of Illinois, Urbana-Champaign. Khan left Flex-N-Gate in1978 to found his own company, Bumper Works, and created a new one-piece car bumper design that would become the industry standard. He bought his former employer two years later and merged operations. Over the next two decades, Khan expanded Flex-N-Gate’s operations with contracts to provide parts to many of the largest automobile companies, including Toyota. Still a private company, Flex-N-Gate surpassed $3 billion in sales this year, according to the company, making it the 14th largest North American automotive supplier. It employs over 12,450 people internationally at plants throughout Canada, the United States, Mexico, Argentina, and Spain. Flex-N-Gate’s manufacturing expertise has expanded to include interior and exterior plastics, lighting systems, mechanical assemblies, metal structural body components, and exterior metal parts. Khan previously tried to buy the St. Louis Rams last year, but was blocked when fellow billionaire and then-minority Rams owner Stan Kroenke exercised his right of first refusal option to purchase the team himself. He has agreed to pay $760 million this time for 100 percent control of the Jaguars; that price includes the assumption of the team’s debt and some debt of his own. The new Jaguars owner has a complicated history with the IRS, which accused Khan and his wife of trying to illegally shelter $250 million from federal taxes from 1999 to 2003. Khan, who has said he repaid the $68 million in disputed taxes, currently has lawsuits pending against both the IRS and his former financial advisers. Outside of Flex-N-Gate, Khan also founded and owns two smaller companies, Bio-Alternative, a bio-diesel tech company, and Smart Structures, which monitors the structural health of bridges. Khan and his wife Ann have also given back millions of dollars to their alma mater, the University of Illinois. On campus, they’ve endowed five Khan Professorships, the Khan Annex library expansion, and the Khan Outdoor Tennis Complex.